The Mongolian Technical University is the leading university responsible for engineering education in Mongolia and has been playing an important role in the national development of the country. MTU consists of 16 schools and 50 departments, including Mining School. 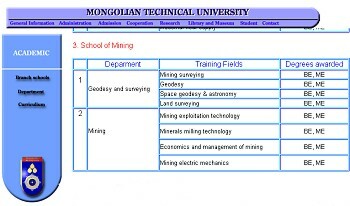 Currently Mining School employes about 50 lecturers and assistants inclusing 15 PhD in the three departments of Mining Engineering, Mining Electric and Mechanic Engineering, and Geodesy. The main duty of the Department of Geodesy is to prepare engineers in the field of Surveying, Land Surveying and Mining Surveying. In the academic year 2000-2001 there are over 250 students. Additionally the Department of Geodesy is carrying out the scientific and field research in cooperation with domestic and foreign institutes in the following areas: - Development of National Geodetic Control Network by GPS technology - LIS and GIS of Ulaanbaatar City - Digital mapping for agricultural areas of Ulaanbaatar.